In today’s connected world, running out of ‘juice’ continues to be a problem as smart phones and devices are constantly in use. 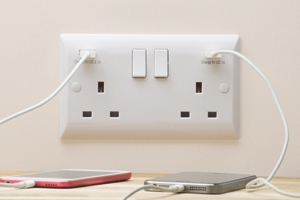 Cue, Hamilton’ stylish Vogue™ range of switched socket plates that have integrated USB charge points. Unlike some competitor accessories, Hamilton’s Vogue™ offers both ‘single’ and ‘dual’ socket plates with integrated USB charging ports. The 1-gang switched socket has a single USB charge point rated at 2.1A, while the 2-gang has a 1A rated USB port for mobile phones and a second 2.1A USB port for charging tablets and other devices. The increased charging capacity of the 2-gang socket plate allows both a phone and a tablet to be charged simultaneously, rather than using just one function or the other, as with other competitor products. These switched USB outlets are now available as standard within Hamilton’s Vogue™ range. This entry was posted in News and tagged Electrical, Plugs, USB. Bookmark the permalink.